On the fascination of microscopy and some curious amateur observations of the moon. ADAM’S lack of foresight when he named the creatures of the earth (Genesis 2:19) certainly made things difficult for his scientific descendants. If he had made a list of the animals as he named them, how easy it would now be, for instance, to label a microscope slide! As it is, the rediscovery and renaming of the world’s organisms has been slow, painful work. Aristotle knew about 520 animals and Theophrastus could identify approximately the same number of plants. Today, thanks largely to Linnaeus and to the invention of the microscope, our catalogue has grown to about a million species of animals and 336,000 species of plants. But the census of life on the earth is far from complete; no one knows how many thousands of species remain to be discovered and identified. The quest to complete the roundup of organisms and to name them is one of science’s most rewarding challenges. And for amateurs in science it offers a sport second to none. An amateur can engage in it simply by acquiring a microscope, since the biggest remaining field for exploration is in the world of small organisms. Ross points out that it is possible to make a workable microscope at home in less than an hour, and that one does not need to look far for material to study. “The saliva from your own mouth,” he says, “will provide enough varied specimens to keep you going for months on end. The more organisms we find and identify, the more, it seems, await discovery. Historians are not sure who invented the microscope. Like many products of technology, the instrument seems to have evolved from many tidbits of accumulated knowledge as intertwined and difficult to trace as the roots of a thousand-year-old redwood tree. The oldest magnifying lens so far discovered was found in the ruins of Nineveh by the British archaeologist Sir Austen Layard. It was a crudely polished planoconvex lens of rock crystal which magnified rather well. Pliny the Elder in 100 B.C. mentioned the “burning property of lenses made of glass.” But the science of optics in the modern sense did not begin until about the loth century. The simple microscope—the single lens—must have been used as soon as spectacles were invented, or perhaps it even preceded them. Who was the first to use it we do not know. But the first to make any important discoveries with it was the Hollander Anton van Leeuwenhoek, born in 1632. After examining some common materials through a simple, single-lens instrument he had made himself, he wrote excitedly to the Royal Society in London about all the seemingly unbelievable objects it revealed. He discovered “wigglers” and “worms” in water taken from the canal of his native Delft and in scrapings from his teeth. Perhaps his greatest contribution was the observation of red corpuscles in blood. Leeuwenhoek not only identified the red cells but made accurate drawings of their shape and forwarded them, along with measurements of their approximate size, to the Royal Society. Anyone with a little time to spare can make a duplicate of Leeuwenhoek’s microscope and enjoy a thrill now 300 years old. Ross urges beginners in microscopy to start with a Leeuwenhoek instrument. It is easy to make and will give the beginner valuable experience in preparing and handling specimens. For materials you need only a small length of thin glass rod, a piece of about 20-gauge iron or brass one inch by three inches, two machine screws with nuts, a tube of quick-drying cement and a bit of cellophane. We have made several satisfactory miscroscopes of these simple scraps of material. For the glass rod a clear “swizzle stick” of the kind used for stirring drinks will do. First you hold the center of the rod in the flame of a Bunsen burner or a burner of the kitchen stove. The rod is introduced into the flame gradually to avoid the breaking stresses set up by abrupt heating. The center of the rod will quickly reach red heat and become plastic. Withdraw the rod from the fire quickly and stretch it. The plastic center will pull into a hairlike filament about two feet long. After the rod has cooled, break off a convenient length, say six inches, from the middle section of the filament. Then slowly bring one end of this thread into contact with the flame. The tip will reach incandescence almost at once, and a tiny bead will form. Keep on feeding the filament into the flame until the bead grows to a diameter of approximately one sixteenth of an inch. The lens of your microscope is now finished. This little bead, if it has been made carefully, will yield a magnification of approximately 160 diameters. (The power of such a lens is roughly equal to the number 10 divided by the diameter of the bead in fractions of an inch.) The quality of the lenses made by this primitive method is far from uniform; hence several should be made and the best selected. A bit of the glass filament may be left attached to the bead and used for mounting the lens to its base. Leeuwenhoek mounted his lens in a sandwich of two brass plates with a hole for the lens. But we find it more convenient to drill a hole in a single plate and fasten the glass piece to the plate by its stem, with the bead over the hole. The hole should be slightly smaller than the bead, so no light will leak past the lens and thus dilute the contrast of the image-. The glass is fastened to the plate with quick-drying cement. The focal length of this tiny lens is of course very short. This means that the stage on which a specimen is mounted must be close to the lens, sometimes nearly touching it. For focusing his microscope and moving the specimen into its field Leeuwenhoek used a set of interacting screws, manipulating a metal point as the stage (see Roger Hay ward’s drawing on the opposite page). In our version of his instrument we substituted a bit of cellophane for the point and fastened it to the adjustment mechanism with cement. Specimens are cemented to the cellophane. Unfortunately Leeuwenhoek’s microscope lacks the viewing comfort of modern instruments. To see the enlarged image you must bring the lens very close to the eye. Hayward has drawn a larger model which employs a conventional slide as the stage, a mirror for controlling the light and a more convenient focusing adjustment. This arrangement adds to the instrument’s convenience but does not eliminate the necessity of bringing the eye close to the lens (see drawing above). Considering its primitive design, Leeuwenhoek’s microscope reveals an astonishing amount of detail. Leeuwenhoek is supposed to have worked successfully with smaller beads, which gave higher magnification, but he quickly learned to value resolution over magnifying power and to work with the lowest power possible. A big fuzzy image has no advantage over a small fuzzy one. Since Smith’s day generations of slide makers have developed techniques for the preparation of specimens which are almost as fascinating as the operation of the microscope itself. Some relatively huge specimens, such as the dry root of a hair or a dried flea from a dog, require no more preparation than being attached to a slide with a dab of Canada Balsam or some other slide cement and covered with a thin glass. Minute objects such as red blood corpuscles can be viewed with reasonable satisfaction if they are merely smeared on a slide J	* and protected with a cover glass. But others which are thick and opaque, or transparent, or contain water in their structure, require special treatment. If the interior of a specimen is to be studied, either its top must be cut away or, if it is translucent, it must be lighted from below. Some specimens must be cut into extremely thin slices. There are slicing machines called microtomes which can cut frozen tissue or tissue embedded in wax into sections almost as thin as a single wavelength of light. In addition to solving the lighting problem, thin sectioning simplifies the image, for the microscope magnifies in all dimensions. Amateurs do not, however, need an elaborate cutting machine; they can prepare slides with a safety razor blade. When an organism is completely transparent, it may have to be dyed or embedded in a light-refracting substance. The staining process is an art in itself, because staining substances always produce a chemical change in the organism. Sometimes the stain affects one part of the cell and not another. By using different chemicals one may dye the nucleus one color and the surrounding cytoplasm of the cell another color. Many bacteria can be distinguished from one another only by the way they take a stain; this is the basis, for example, of the classification of “gram positive” and “gram negative” bacteria. The preparation of slides for the microscope has developed its own special literature, with whole volumes devoted to such subjects as techniques of desiccation; cleaning; bleaching to remove pigments which obscure the view; methods of floating objects in liquid cells; the selection of cover glasses with optical properties matching those of the instrument; the polishing and etching of metal surfaces to reveal crystal structure—processes almost as numerous and varied as the objects that go under the instrument’s objective lens. Like all other scientific avocations, the preparation of specimens for the microscope invites the amateur to plunge in as deep and stay down as long as he likes. After building and using a Leeuwenhoek instrument you may very well decide to go further. A conventional compound microscope will save a lot of squinting. It should be an instrument of good quality, capable of showing fine detail. Its power should match the ability of the beginner. High-power objectives invariably prove disappointing to beginners, because their successful use calls for substantial skill. A good secondhand beginner’s microscope can be purchased for $60 or less. Having acquired an instrument, what next? According to Joseph F. Burke, who like Ross is a member of the New York Microscopical Society, the minute plants called diatoms are ideal subjects for the beginner. “Diatoms grow,” says Burke, “wherever there is light and moisture. This means that they can be collected in nearly every part of the world. They can be found on the beach, among the plankton at sea, on the mud bottom of ditches, on the stems of water plants, in the scum on stagnant pools, even in desert sands, for their silica shell remains as a fossil after they have died. A formation of living diatoms usually has a brownish tint, caused by a pigment which obscures the plant’s chlorophyll. Deposits of fossilized diatoms, laid down on the bottom of ancient seas, are mined as diatomaceous earth, valued for its mild abrasive action. Many silver polishes are rich in fossilized diatoms—a convenient source the beginner should not overlook. “For live collecting the amateur should equip himself with a few wide-mouthed jars, a spoon and an ordinary coffee or tea strainer of 40 or 50 mesh. As specimens are taken in the field, the collector records the date, time and location along with other data that will assist in the subsequent identification of the material. “To prepare diatoms for mounting, the amateur will need: technical sulfuric acid, technical hydrochloric acid, hydrogen peroxide, powdered potassium bichromate, distilled water, strainers of 40 to 50 mesh, two Pyrex beakers holding 30 cubic centimeters, a Pyrex custard dish, a conical flask of 125 c.c., an assortment of pint and quart jars, glass stirring rods, half-ounce storage bottles with caps, and clean pipettes. “The collected material should be transferred to a large jar. Filtered water is added and the material is thoroughly beaten with a glass stirring rod to dislodge the diatoms from foreign objects. The organisms should then be strained and permitted to settle; allow an hour per vertical inch of solution. Living diatoms should be processed in a darkish place, because their metabolic processes release tiny bubbles of oxygen which cause the organisms to rise to the surface. Having settled, the diatoms will form a brown layer on the bottom of the jar. The water should then be poured off without losing the specimens. This washing process should be carried out three or four times, particularly when the diatoms are salt-water species. Distilled water should be used wherever the local water supply carries a heavy content of lime. “Part of the material is then transferred with the pipette to the Pyrex beaker to form a layer about an eighth of an inch thick. The beaker should be placed in the custard cup. The excess water is removed with the pipette, leaving the specimens moist but not wet. Next powdered potassium bichromate, approximately one third the bulk of the diatoms, is stirred into the mixture. Then comes an operation which must be performed outdoors or in a window with a strong outward draft, as the reaction produces poisonous fumes. Slowly add approximately five c.c. of technical sulfuric acid to the diatom-bichromate mixture. A violent reaction will follow. Beat down the resulting bubbles with a stirring rod. Should the heat of the reaction break the beaker, the custard cup will prevent the loss of the specimens. “The material is then transferred to a quart jar and washed with distilled water five times, allowing about an hour of settling time for each vertical inch of water. The diatoms are now ready for separation according to size. This is accomplished by the familiar process of elutriation. The material is transferred to the first of a series of uniform glass containers. Water is added, and after a certain interval, say half an hour, the water is poured off carefully into the second jar of the series. Again at the end of the predetermined interval, the second jar is poured off into the third. This is repeated until the diatoms are separated into the desired sizes. The diatoms are now ready for m individual storage bottles, to which a few drops of hydrogen peroxide may be added as a preservative. “For mounting diatoms, select a cover glass of 12-millimeter diameter and a thickness of .11 to .20 mm. The slide itself should have a thickness of 1 mm. (A supply of cover glasses, slides and mounting cement or ‘medium’ is available at most optical shops.) Clean the slide and cover glass thoroughly with soap and water. Select a storage bottle containing diatoms and shake it until they are in suspension. With the pipette place a drop of distilled water in the center of the cover glass. If the glass has been cleaned properly, the water will spread to the edge but not overflow. Next add a drop from the storage bottle which holds the diatoms in suspension. The diatoms will spread evenly and settle on the glass. Allow the water to evaporate overnight. Protect the glass from dust. “You will next need a small hot plate and a bottle of medium. I prefer Hyrax for mounting diatoms. Warm the slide on the hot plate and place a drop of Hyrax on the slide’s center. Then re-move the slide from the hot plate and place it on a wooden support to prevent rapid cooling. With sharp pointed forceps, pick up the cover glass, invert ii so that the diatom side is down and press it gently onto the medium until the fluid reaches the edge of the cover glass. The slide is then returned to the hot plate and the Hyrax is brought to a state of vigorous bubbling. As the bubbling slows down, remove the slide to the wooden support. Experience will teach the proper moment of transfer. “After cooling, the slide is placed under the objective and examined. If the washing and mounting have been performed carefully, the amateur is in for a thrill he will long remember. Diatoms have been called ‘nature’s jewels,’ and man has yet to fashion anything more exquisite. ASTRONOMERS define selenography as the study of the surface of the moon. They are so busy with the stars and the universe, however, that they have no time for selenography. Thus the moon has long been left almost entirely to advanced amateur astronomers, who find it made to order for their more limited resources—and also endlessly fascinating, with its maze of more than 30,000 craters, cliffs, rills and rays. When a telescope user ceases to look at the moon in a merely desultory manner and begins to observe it, he has begun to be a selenographer. He singles out small areas or formations and studies them minutely throughout the long lunar day, at every hour of which the changing angle of the sunlight alters their appearance. While doing this he learns the lunar map, partly by copying and then drawing it from memory, partly by making sketches directly at the eyepiece of the telescope. If these sketches are dated and saved from the very beginning, his observations will be all the sharper. The ability of the eye to see detail improves immensely with practice. The training of the powers of observation would be tedious if the telescope owner did not fan his interest by reading the literature to learn what other selenographers are doing. Perhaps the easiest way to start is by joining the Association of Lunar and Planetary Observers, 1203 North Alameda Street, Las Cruces, N. M., and reading its monthly organ The Strolling Astronomer. By following up the leads in its articles the beginner soon learns his way about in the world of selenography and is introduced to the many controversies in this field. Of these perhaps the most interesting is the question: Does the moon’s surface ever change? Most astronomers believe that it does not, even in fine details. On the other hand, most selenographers believe that small changes do occur. Dismissing the theories of the astronomers on the ground that they do not observe the moon, the selenographers insist that their minute and systematic observations over many decades have confirmed a number of changes. The most noted change was the disappearance of the crater Linne, six miles in diameter, some time between 1843 and 1866. After its disappearance, a white spot surrounding the crater steadily diminished in size and brightness until 1897, but then grew again and has now regained its earlier size. For many years the American selenographer William H. Pickering noted irregular changes in the sizes and shapes of dark regions within the ring plain Eratosthenes. Then there is the ring plain Plato, which is obscured at irregular intervals by some kind of haze or vapor. 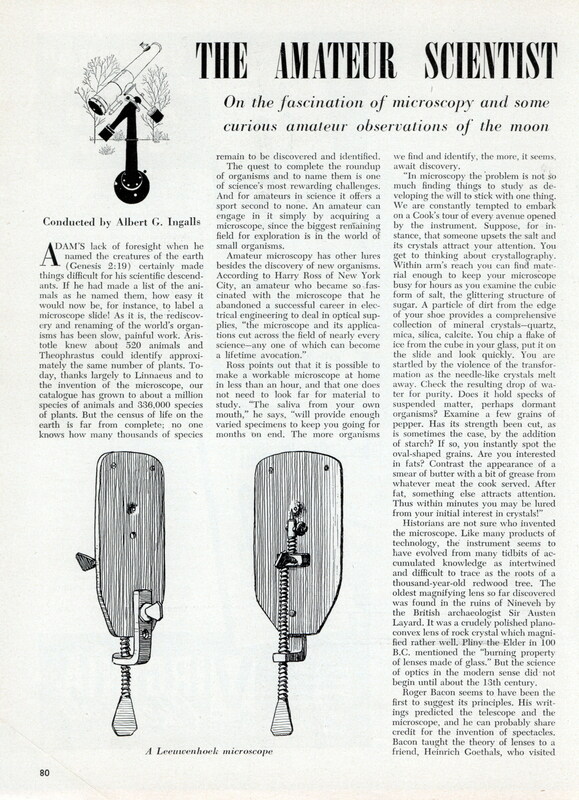 In 1942 Walter H. Haas, now editor of The Strolling Astronomer, summarized changes that selenographers had seen in 21 lunar formations in a series of articles in The Journal of the Royal Astronomical Society of Canada. Last year the selenographer H. P. Wilkins, director of the lunar section of the British Astronomical Association and maker of the best detailed map of the moon, described 15 anomalies that he had observed in 40 years of lunar observation with telescopes from 3 to 15 inches in aperture. Wilkins said: “Things do happen and are continually happening on the moon.” It is not a dead world. In the last two years readers of The Strolling Astronomer have followed a long account (15,000 words) of a lunar formation which seems to the Baltimore selenographer James C. Bartlett, Jr., to be playing a game of hide and seek. It is a puzzle that has fascinated selenographers for over 100 years. Some time prior to 1837 Johann Maedler of Berlin saw a remarkably perfect square 011 the region of the moon between the ring plain named Fontenelle and the walled enclosure called Birmingham. The square was 65 miles on a side and had walls one mile thick. It is shown in Roger Hayward’s drawing above, reproduced from a drawing published in 1837 by Maedler and his collaborator Wilhelm Beer. On the floor of the square Maedler saw a very regular cross. In 1876 Edmund Neison, director of the Natal Observatory in South Africa, also published a lunar map containing Maedler’s square, which he had observed himself with a six-inch refracting telescope. He described it as “a square with regularity and perfect form, its walls from 250 to 3,000 feet in height.” Neison’s drawing is reproduced here by Hayward, himself a selenographer. Thus two of the founders of selenography testified that the square was real in their time. Yet in 1949 Bartlett, after studying the area of the square for more than an hour with his 3.5-inch reflecting telescope on a very fine night, failed to find it! The “fact emerged,” he says, “with the impact of a hydrogen bomb. No such formation existed.” Another selenographer, E. J. Reese, confirmed the disappearance. Bartlett later found two walls of the “square” (the ones on the lower left-hand and right-hand sides of the drawings), but he could detect 110 trace of the other sides. The next participant in the discussion in The Strolling Astronomer was Patrick A. Moore, secretary of the lunar section of the British Astronomical Association. 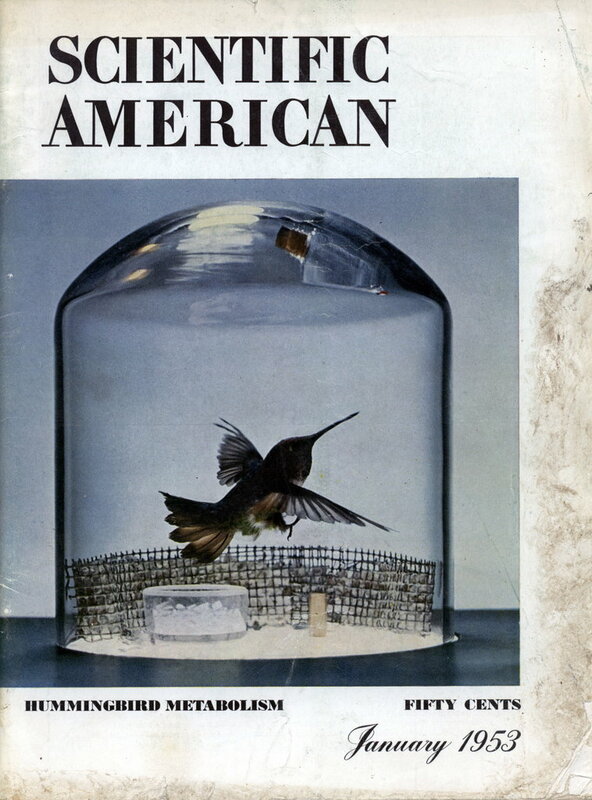 In July, 1951, he said that the Bartlett article had aroused a great deal of interest in Britain. He sketched the area with his 8.5-inch reflector, using powers from 200 to 400. Moore, a very experienced observer, found three walls of the square clearly visible and the fourth faintly so at times. But the square was not the neatly geometrical, fortress-like form Maedler had described, and all but one of its walls were very low. Moore’s findings are pictured in the drawing labeled with his name. The wall at the bottom of the drawing is extremely low. At its left end is a small quadrilateral bounded by four hills connected by low ridges. It contains a small crater and fine detail of the kind selenographers delight in delineating as a test of their observing skill. The left wall, extending upward from this corner, ends in a series of heights which are very conspicuous during the times of the month when the shadows reveal them. The wall at the top of the drawing is very low indeed and perhaps discontinuous. At its right-hand end is a prominent crater. Finally, on the fourth side of the ¥ / square is a trace of a wall so low that it has to be caught under favorable conditions of illumination to be seen at all. Moore’s careful observations seemed to have settled the question. But 14 months later Bartlett announced new evidence. Photographs taken with the 36-inch Lick refractor, he said, fail to show any eastern wall for the square. He suggested that the extremely low object seen there by Moore could not have been seen by Maedler and might possibly be the remains of a wall that was actually present in Maedler’s time. He dismissed the idea that Maedler’s observation was due to the inadequacy of his telescope, noting that Maedler was able to see objects much smaller than the square. The Lick pictures, incidentally, raise a question. Since anyone can purchase prints of photographs made with large telescopes, including the 100-inch, why do selenographers strain to see minute lunar details with their own small telescopes? One reason is given by Walter Goodacre, a former director of the lunar section of the British Astronomical Association. He points out that under the best seeing conditions an observer can see as much detail with a high-quality ] 0-inch refractor as is shown on photographs made with a 100-inch telescope. When used visually, the large telescopes give better detail, but they are rarely available to selenographers. Recently Bartlett rediscovered Maedler’s cross—a dull, whitish formation— and Reese verified the find. “Now,” says Bartlett, “this wonderfully establishes Maedler’s accuracy. Have we any further reason to doubt that Maedler had faithfully depicted the square?” A few months later, with Maedler’s cross plainly visible, Bartlett observed to the east of it a smaller, dark gray cross very difficult to see. Neison discovered this cross long ago when Maedler had missed it-proving, Bartlett says, that Neison did not merely rehash Maedler’s book for his own. Got my first microscope about this time, and the article even has the ad from Edmund Scientific – $14.95. Many fond memories of watching the excitement in a drop of pond scum. The amateur Scientist column is awesome. It ran for 50+ years. The illustrator is the famous artist Roger Hayward. They did great stuff. Imagine your own particle accelerator or homemade x ray machine.